Contrast by Detail Levels uses wavelet decomposition to decompose the image into six levels, each adjusted by a slider. Slider 0 (Finest) has a pixel radius of 1, sliders 1 to 5 have a pixel radius of approximately 2, 4, 8, 16 and 32 pixels. Giving a slider a value less than 1.0 decreases local contrast at that level, while giving it a higher value increases it. Thus you can use it to increase perceived sharpness of an image, to increase local contrast, or to mitigate certain levels of detail. You should remember that resizing an image has a direct impact on perceived sharpness, as does viewing distance. In practical terms this means that you should use this tool while zoomed more or less to a level representative of your intended final image size and viewing distance, so if you intend to print the high resolution image on a 90x60cm canvas and admire it from 30cm away then it makes sense to zoom in to 100% and tweak the "0 (Finest)" slider. However, in real life such large prints usually hang on the wall and are appreciated from the couch a few meters away - from there the finest detail level setting will have no effect whatsoever - your eyes cannot make out the detail from that distance. The same goes for images you intend to resize (downscale) for use on the internet or email to friends or clients - not only do you lower the resolution by downscaling, but they will also be viewed on low resolution devices, probably not even fullscreen, e.g. on a laptop, tablet or phone. In this case too playing with the "0 (Finest)" detail level will make no difference to the end result. Most of the time only sliders "3" and "4" will have a practically useful effect. At 100% zoom, Contrast by Detail Levels removed skin blemishes and enhanced skin texture. At 25% zoom, the effects of the first three sliders are lost by the downscaling process. If you want to downscale the photo to use it on the web, you should zoom out to about 25% which is more or less the size at which the image will be viewed. Using the settings above we can still see that the skin is smoothed, but if you reset the first three sliders to "1.0", you will see doing so made no difference! The reason is that at this smaller resolution, changes to those levels are lost in the downscaling process. The result would be identical if you saved the full-sized image and then downscaled it to 25% afterwards in some other program, so don't think this is RawTherapee's shortcoming - this is simply how sharpness (resolution and acutance) work. Knowing this, if you only intend to share the downscaled version of your photo, you can save yourself time by simply ignoring the first three sliders. At 25% zoom we saw what was not clear at 100% zoom, that the harsh shadows can further be softened using the "4 (Coarsest)" slider. Furthermore, you may find when you zoom out that the sliders had effects which were not immediately apparent at 100% zoom. For example you may find that using the "4 (Coarsest)" slider can pleasantly mitigate large, harsh shadows, so set it to 0.5 and fine-tune to taste. This combo-box lets you decide when in the pipeline the CbDL tool will run. This tool had been added to RawTherapee long ago, and more recently the Black-and-White tool was added, placed before CbDL in the pipeline. An unforeseen result was that if you enabled the B&W tool then you could not use CbDL's Skin Targetting/Protection because a black-and-white image has no skin color information. This combo-box was added to remedy the situation. 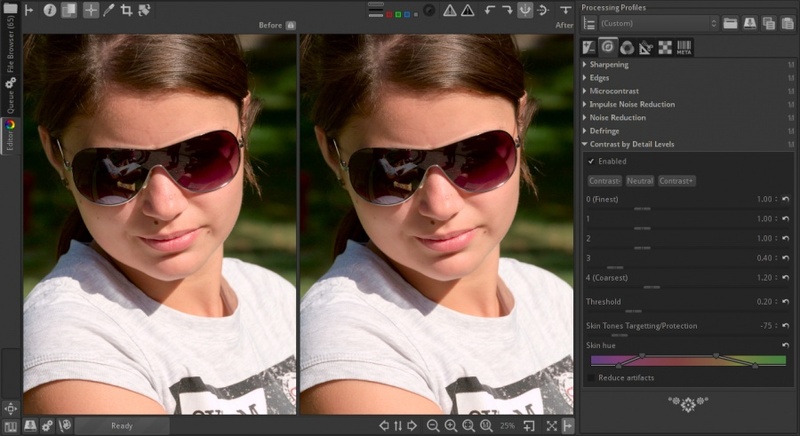 Running the CbDL tool before the B&W tool lets you target skin tones before conversion to black-and-white. We recommend you stay with the default option, "Before Black-and-White". Use the "Contrast-" button to move all five sliders by preset amounts to the left (noise reduction). 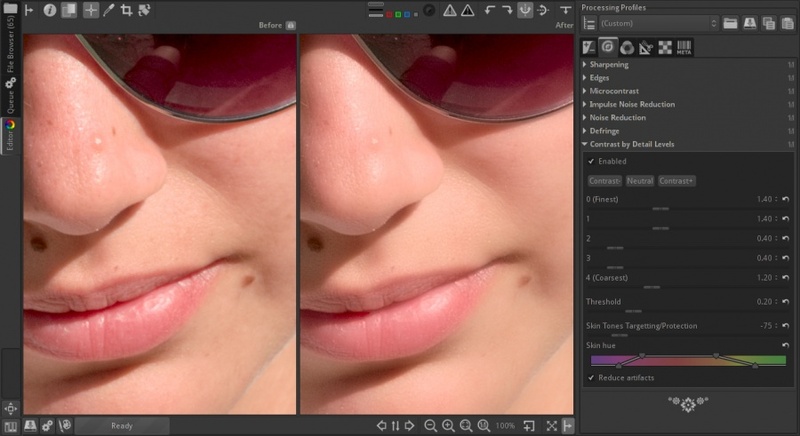 Use the "Contrast+" button to move all five sliders by preset amounts to the right (sharpening). Use the "Neutral" button to reset all sliders to 0. Feel free to move individual sliders as well, and inspect the results in the detail window; you may want to zoom in to 200% or more to see better what this filter does. For high ISO shots (1600+), try for example clicking on the "Contrast-" button twice and using Sharpening > Unsharp Mask with an amount of 80. The "Threshold" parameter is used to prevent the sharpening of noise: if a pixel's luminance differs only a bit from its neighbors (the difference is less than the threshold), then it is not sharpened. You can set the threshold also to 0 but then everything will be sharpened (even the noise). This page was last edited on 5 November 2016, at 16:19.